3. Connect the main imaging camera and the guide camera. No guide scope required! 4. 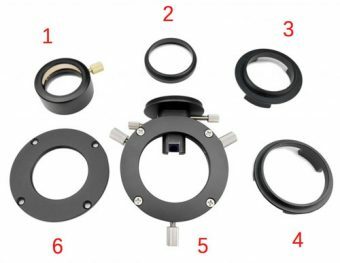 Flexible adaption to your camera and telescope , such as T2, M42 and M48. NEW from ZWO Thin Off Axis Guider that allows you to Autoguide in SCTs and Refractors whilst only adding 16.5mm to the optical path. 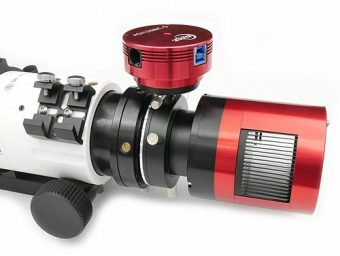 Features a precision 8mm x 8mm prism, it comes complete with M48 and T2 adapters to the scope and M42 and M48 adapters to camera to keep back focus to a minimum, a 5mm spacer for guide cameras where the back focus is only 12.5mm. Compatible with all ZWO ASI cameras. A must for Cassegrain OTA’s. No guide scope therefore no differential flexure between Guide scope and main telescope.